Your dream house is located on the peninsula Coquina Key in St. Petersburg, in the middle of a small and well kept residential area. The peninsula joins the continent in two places. The house is located on a 1000 m2 surface, directly on a bay with a boat landing place. It has a living area of 190 m2. The living surface consists of 3 bedrooms (all of them are equipped with queen and king size beds), 1 cot and 1 highchair, 2 bathrooms, 1 big exclusive kitchen with a dining corner, 1 dining room and 1 living room. In addition, there is a garden with tropical plants, banana tree, a big covered terrace, swimming pool and whirlpool (both of them can be heated), an outdoor shower, a central house radio system, 2 TV sets (cable TV with about 80 channels, German TV), 2 VCR, 1 with DVD, a portable compact stereo system with CD player, dish washer, washing machine, dryer, toaster, micro wave oven. The terrace and the pool are equipped with screens, for your protection against insects. Distances to the beach: Our house is located on the island Coquina Key in St. Petersburg, and it is only a 15 minute drive away from one of the most beautiful beaches in the whole USA, namely the St. Pete Beach. This is a miles long beach, which offers all the beach related activities. At the same time, you can enjoy the silence, the relaxing atmosphere here, and the wonderful nature here. You can reach other beaches in St. Petersburg in only 5 minutes, and they are ideal for bathing and swimming as well. The beach of Tierra Verde (Fort Desoto Park) is also very interesting and wonderful, and you can reach it in only 10 minutes by car. Here you have the possibility to use covered barbecue places, so that you can enjoy an American barbecue. There are also sanitary facilities (showers, WC, changing rooms), all of which can be used for free. About us: We would like to introduce ourselves: we are Karin und Walter Modispacher, we have been married for 30 years, and we have 2 adult children. After my husband had discovered the special features and the beauty of Florida during his numerous business trips, we decided in 1992, to buy a house in St. Petersburg. We chose the peninsula Coquina Key. This is a very quiet region, but it also has a very central location, compared to all the starting points of St. Pete. Since then we have been spending a lot of time in our ‘small paradise’. Even our children enjoy spending their vacations here, with us and with our grandchildren. We would be very happy to welcome you on ‘our’ island and in our house. Sights in St. Petersburg and the surroundings: Salvador Dali Museum, The Pier, Bush Gardens, Lowry Park Zoo, Tampa Museum of Art, Greyhound Track, The Florida Aquarium, Tampa Bay Performing Art Center, Sunken Gardens, Sarasota Jungle Gardens, Mote Marine Aquarium, Adventure Island, Tarpon Springs, and many others. Information on special equipment: cable TV, including transmission of Formula 1 and German Football League, German TV with up to date transmissions from ARD, ZDF, Euronews and Deutsche Welle. 3 colour TV sets are available in the house, as well as 2 VCR and 1 DVD player. Thanks to the location of the house, it is possible to enjoy the days here outside even in the cold seasons, without being bothered by winds. The complete pool area is equipped with protection screen against insects. It is a big advantage that you are protected against mosquitos in our house. The whirlpool with whirlpool heating (water heating up to 37° Celsius) is included in the rental rate, no extra charges are required. Service was good, Wi-Fi was awesome, amenities were outstanding. All the things you need, from towels to washer and dryer. Utensils were plentiful. We have rented before but never had the feeling like we were at home. This house gives you that feeling. House is about 30 years old and is a bit dated. Pool and hot tub were great, view of the cove was so relaxing. The kids loved fishing off the dock. Nice having a garage to park the rental car in, as well as beach chairs and a cooler available for use. Such great amenities that you don't get in just any rental! We had two different local contacts available to us if we had issues with anything, which we didn't. If you are looking for TRANQUILLITY and fun for the whole family, it's here. The photographs look really good but don't do the property justice. Everything catered for, right down to a special basket of fresh towels, located just inside the kitchen screen, provided for everyone around the fantastic pool and spa area. Fishing from the dock with the house rods provided a daily competition for the biggest and most caught.Loser had to make the cocktails for all in the hot tub at dusk. A special thanks here, for the lanai, NO BUGS. The kitchen fulfilled all our needs including the amply sized fridge/freezer providing plenty of ice for drinks etc. Having a washer and drier at our disposal was fantastic - fresh towels every day - and reducing the amount of clothes we had to take on vacation with us. Extremely comfortable beds and living accommodation all kept nice and cool by the AC and ceiling fans. With a 8-10 mins drive to downtown St Pete and about half an hour to fantastic beaches, nature parks and restaurants what else could one ask for. I know............Longer holidays. We will be back. Thank you very much. We are so happy that you love this place as much as we do. Beautiful, roomy, best vacation ever! Renting this house for our vacation was the best thing we ever did! The area was safe and quiet and the house was very comfortable, clean and accomodating. It had everything you could possible need. My husband, myself and our three sons (12, 14 & 16) had a wonderful time playing in the pool and relaxing in the hot tub. We spent the days fishing off the dock and even saw dolphins in the bayou a few times! It also wasn't uncommon to have feathered friends hanging out with us while we fished! We also visited the Tampa Bay Rays baseball stadium, the Pier, the Salvador Dali museum and so many more things which were only 5-10 minutes away. There wasn't much for restaurants in the immediate area but definitely try the Chattaway Drive-In down the street! And if you go about 10 minutes to the heart of St. Pete there are plenty of places to eat. Initially when I began the rental process I was nervous because the owner was not in the US and there are so many scams, but everything went flawlessly and it ended up being the best vacation we ever had. Honestly, I cried the day we left because I'd had so many awesome memories!! I recommend this rental to everyone and would LOVE to go back there! Tolles Ferienhaus in super Lage & top Ausstattung! Auch fanden wir es sehr nett von Ihnen, dass Sie zu Beginn unseren Urlaubs im Ferienhaus angerufen haben um zu fragen, ob alles okay wäre und ob wir uns zurecht finden! Und auch als es dann mal Probleme mit dem Jacuzzi gab, haben Sie uns sehr schnell weitergeholfen bzw. dann auch die Pool-Firma organisiert. Das war vorbildlich. Vielen lieben Dank nochmal für alles!!!! Urlaub wie man sich es erträumt ! Nun hat es endlich mal mit meiner Frau, unseren Sohn und einen Freund geklappt und wir haben uns für dieses absolut tolle Haus entschieden.Wunderschöne Lage,toller Pool,schöne Räume, alles sehr gepflegt! An der Ausstattung und Inventar ist wirklich an alles gedacht. Die Delphine waren natürlich auch zu Besuch und beim Angeln am eigenen Bootssteg hat sogar bei uns was gebissen.Der Nachbar hat den Jungs sein Kajak geliehen und Tipps zum Angeln gegeben.Dieser Urlaub wird unvergessen, mit seinen Grillabenden, Sonnenuntergängen und dem tollen Ambiente dieses Hauses sein. Nochmals ein Dankeschön an die Besitzer, die uns diesen traumhaften Urlaub in Ihren " Big Bayou" ermöglichten. Wir haben über Weihnachten drei Wochen in diesem Haus verbracht und haben uns sofort wie zu Hause gefühlt. Das Haus ist sehr gut und vorallem gemütlich ausgestattet. Innen wie außen ist alles sehr gepflegt und sauber. Die Poolanlage ist genau richtig und man kann sich auf der Terrasse herrlich erholen. Wir können das Haus nur weiterempfehlen und freuen uns bereits jetzt auf den nächsten Aufenthalt. St. Petersburg is located in the optimal neighbourhood of the most highlights of Florida. It has with over 100 km, the widest offer of wonderful beaches. 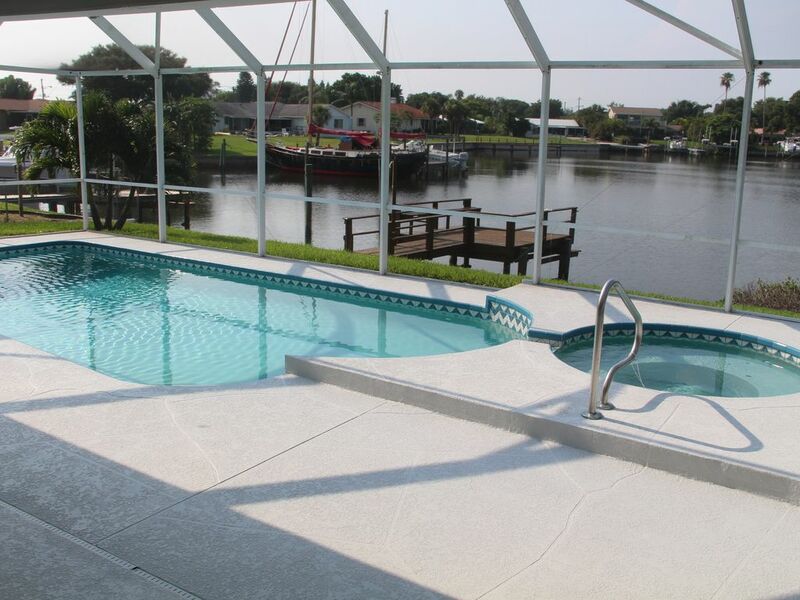 The house is located on the peninsula Coquina Key, in the south east of St. Petersburg, in the middle of a small and well kept residential area. St. Petersburg is, thanks to its central location, an excellent starting point for all the entertainment attractions in Florida. Good examples would be Orlando and Tampa with their thematic parks, which are to be reached in short time.